I recently completed two interior renderings for my longtime friends RTA Architects, and wanted to share what we've been up to. 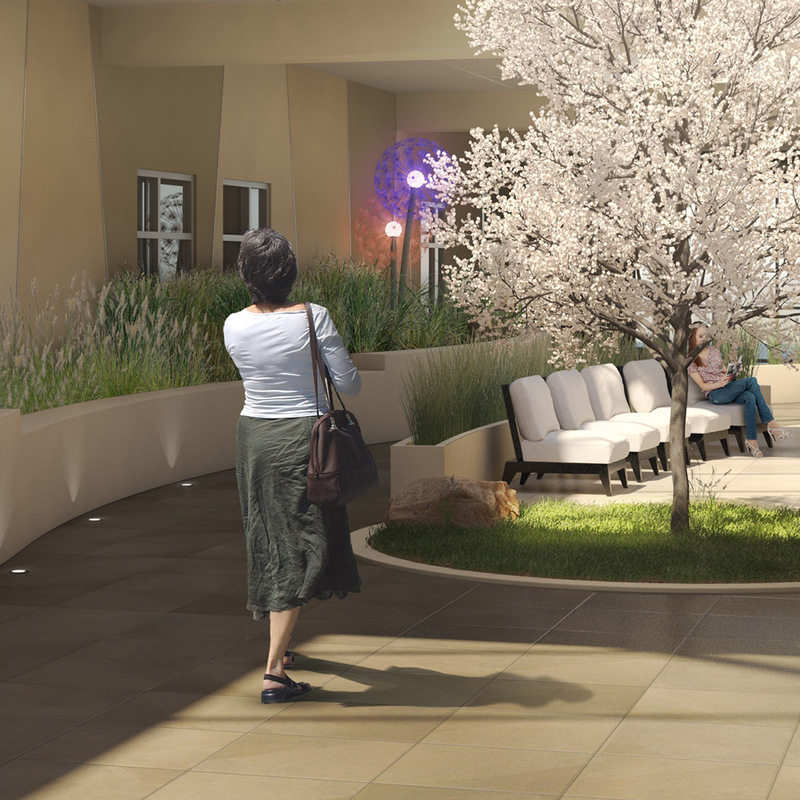 The Wellness Garden is part of an expansion project at St. Francis Medical Center in Colorado Springs, slated for completion in 2018. The design of the Wellness Garden incorporates three zones including a contemplative zone, respite zone and reflective zone, all of which will serve expectant mothers in Labor & Delivery as well as NICU and Pediatric services. This rendering illustrates the design and finishes of the Wellness Garden during daylight hours. I modeled, lit, textured and rendered the space in 3ds Max; the people and realistic grass elements were then composited in Photoshop. Yes, the lighting was quite a challenge! An evening view of the Wellness Garden. Notice the stones embedded in the foreground floor creating a zen-like maze, and starlight pendant lamps in the skylights. Oversized Dandelion light fixtures flank each side of the room, providing a whimsical element identifying major donors of the project. These renderings were developed, in part, to create a connection between the elegant design of the Wellness Garden and potential capital fund donors. For more information about RTA and how they're rewriting the book on Health Care design, have a look at their website here.